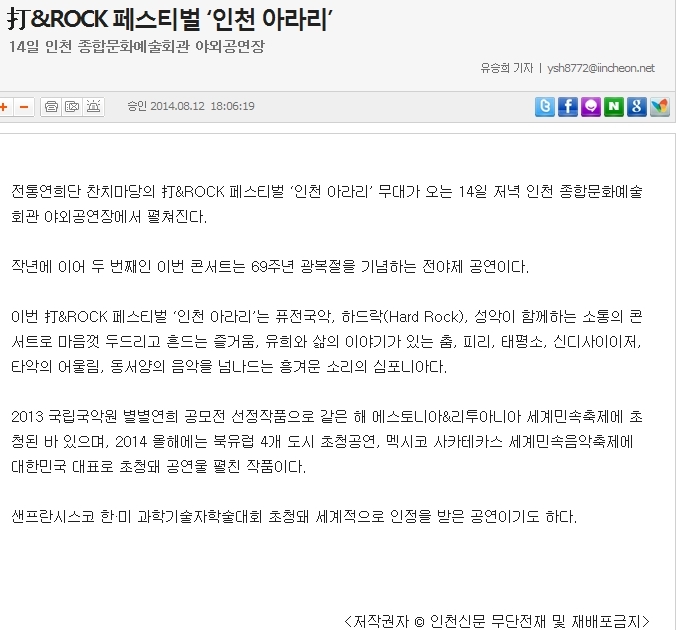 The Ta(타(打),beat)& Rock festival 'Incheon Arari' of Janchimadang will take place on the outdoor stage at Incheon Culture & Arts Center, in the evening of the 14th. This is the 2nd annual concert, celebrating the 69th independence day on its eve. Ta & Rock festival 'Incheon Arari' is a symphonic stage of fun beating, dance with life stories, the harmony of piri, taepyeongso and synthesizer, and joyful music moving back and forth the Asian and Western music. 'Incheon Arari' concert was a selected piece at 2013 National Gugak Center ByeolByeol Yeonhui contest and was invited to perform at International Folk Festival in Estonia & Lithuania the same year, representing Korea. It also has been invited to UKC in San Francisco to be recognized worldwide.